You may already be enjoying the benefits of adding probiotics to your diet, but did you know that these living microorganisms are equally important for the overall health of your cat or dog? Probiotics are “good” bacteria that keep pathogenic, or “bad” bacteria from creating an imbalance inside the gut. In addition to breaking down food and absorbing nutrients, the gut is also home to a majority of the body’s immune system. When gut flora is balanced, the body is better able to fight bacterial and viral infections from taking root. So what happens if pathogenic bacteria aren’t kept in check? Well, they can take over the digestive tract. This imbalance can be a factor in many digestive diseases and disorders we and our pets experience, including gastritis, irritable bowel syndrome, leaky gut syndrome, overgrowth of yeast causing digestive and skin problems, and more. 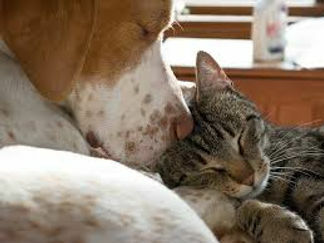 Cats and dogs require probiotics that can survive the strong acids produced in their stomachs. That is why I feel it is so important to use a product made especially for pets. When choosing a probiotic, be sure it is a live product and contains at least 20 million beneficial bacteria from multiple strains (at least 5, but 8 -13 is even better). The product should not contain sugars (like malt) or starches, as both provide a breeding ground for bad bacteria as they digest in the gut. Many brands of probiotics also contain a prebiotic, which are complex sugars that feed intestinal bacteria, including probiotics. Unfortunately, they also feed the bad bacteria, so for cats and dogs with inflammatory intestinal problems, it is a good idea to avoid them. Holistic and integrative veterinarians have been recommending a probiotic supplement for pets for a long time. Recently, conventional vets have also begun prescribing probiotics for their patients experiencing digestive issues. Keep in mind that probiotics are wonderful for nearly all pets, even the healthiest, most robust cats and dogs. I encourage you to look for brands that are not created by big pet food companies or pharmaceutical giants. It is wise to consult with a veterinarian before adding any supplement to your pet’s diet. To find a holistic or integrative veterinarian in your area, visit AHVMA.org.